The beer nerd line these days is that pumpkin beers are mere gimmicks and they come out too early and pumpkin spice is an evil abomination that infects everything with its misery and that beer buying is a zero sum game and if there are pumpkin beers on shelves that means I can't buy other beer. Or something like that. To be fair, my interest in pumpkin beer has waned in the past couple of years and there are legitimate reasons to not like the style, but I like to get in the spirit of the season at least a little every year (and while some brewers around here do Fresh Hop beers, we don't have it quite as good as the West Coasters or, in particular, the Pacific Northwest). Sometimes this is a big win, most of the time, perhaps not as much. About a month ago, I wound up at a friend's house and he broke out a bomber of Pumking and I could have sworn I liked this better before. When I think about it, most of my favorite pumpkin beers are not your traditional style. Stuff like a stouts or weizenbocks or whatever Autumn Maple is seem to be more my thing. Beer Nerd Details: 8% ABV bottled (12 ounce). Drank out of a tulip glass on 10/3/14. Bottled: 08/20/2014. 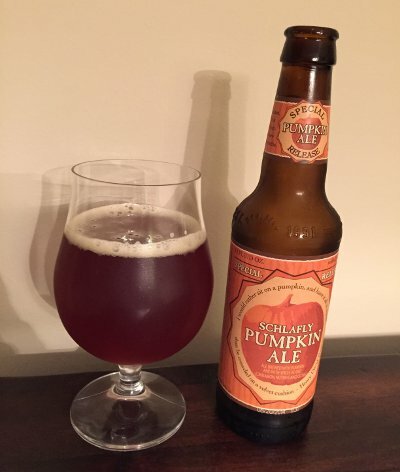 Schlafly has always put out pretty solid beer, and this is no exception. At this point, I'm really curious to try their Christmas beer. And, of course, the BBA Imperial Stout (which I used to see around a lot, but not at all lately, weird). This page contains a single entry by Mark published on October 7, 2014 10:47 PM. Modern Times Fortunate Islands was the previous entry in this blog. Laird's Apple Brandy Black Magick is the next entry in this blog.